Carol has worked in retail for around 20 years in various stores including butchers, supermarkets and card shops. She also worked at the fairground for a spell on the bingo stall and worked as a Community Development Worker in the Newcastle area for four years helping local people. These jobs have helped Carol build her customer service and communication skills as she enjoys working with people. Carol had some health issues so was unemployed on sick leave from May 2016. 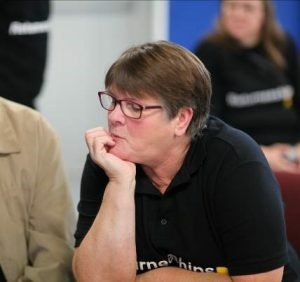 When Carol was signing on in the job centre in November 2016 she was approached by a member of the Release Potential team who spoke to her about the upcoming Returneeship in North Tyneside. Carol decided to sign up for the course saying “I was put off in the past because of my age but this was an older group around my age so I felt more comfortable”. During the first two days of the Returneeship Carol carried out some vital research in to the blue plaques which are located around the North Tyneside area so that the information could be included in a VT for the 30 minute recorded live show. Once Carol had carried out her research she then created a voice over to run along side the photographs taken by others within the group. Carol was also heavily involved with the editing side of the production which improved her ICT skills and helped create the VT’s from the recorded outside broadcasts. Carol said “I enjoyed the class room sessions because they were relaxed and fun. I revisited some skills I already had and learnt new skills”. She also feels like her confidence and self esteem has grown and now feels motivated to look for jobs in the health and social care sector after speaking to one of the tutors on the Returneeship course. Carol said one of the main benefits she gained from the Returneeship was the friends she made over the three weeks. During her time on the Returneeship Carol expressed a passion for moving in to the health and social care sector and this was very clearly seen during her mock interview where she was able to relay why she wanted to work in health and social care and the skills she would be able to bring to the role, saying “I have a passion for working with people”. Carol looked online daily for job opportunities within health and social care and when she did find one which interested her, one of the Realease Potential tutors supported her with updating her CV and applying for the vacancy. Carol attended the interview, which she was given guidance on within the personal development units delivered on the Returneeship, and she was offered the position she had applied for with the company CASA as a care worker.